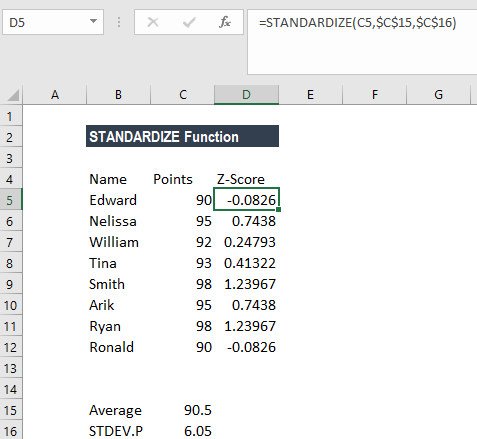 What is the STANDARDIZE Z-Score Function? The STANDARDIZE Function is available under Statistical functionsFunctionsList of the most important Excel functions for financial analysts. This cheat sheet covers 100s of functions that are critical to know as an Excel analyst. It will return a normalized value (z-score) based on the mean and standard deviation. 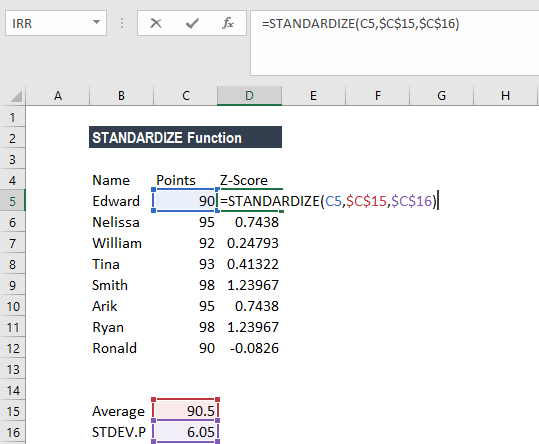 A z-score, or standard score, is used for standardizing scores on the same scale by dividing a score’s deviation by the standard deviation in a data set. The result is a standard score. It measures the number of standard deviations a given data point is from the mean. A z-score can be negative or positive. A negative score indicates a value less than the mean, and a positive score indicates a value greater than the mean. The average of every z-score for a data set is zero. Z-scores are a way to compare results from a test to a “normal” population. The results from tests or surveys can include thousands of possible results and units. However, the results often seem meaningless. For example, knowing that someone’s height is 180 cms. can be useful information. However, if we want to compare it to the “average” person’s height, looking at a vast table of data can be overwhelming (especially if some heights are recorded in feet). A z-score can tell us where that person’s height is compared to the average population’s mean height. X (required argument) – It is the value that we want to normalize. Mean (required argument) – It the arithmetic mean of the distribution. Standard_dev (required argument) – It is the standard deviation of the distribution. 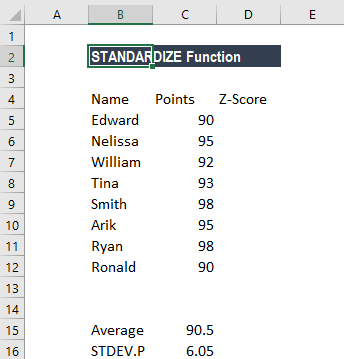 How to use the STANDARDIZE Z-Score Function in Excel? #NUM! error – Occurs if the given standard_dev argument is less than 0. #VALUE! error – Occurs if any of the given arguments are non-numeric.